Santa Barbara Scientific, a company formed by one of the original founders of SBIG (now part of Diffraction Limited), offers a unique product that allows amateur astronomers to measure the true seeing conditions in the areas they practice astronomical viewing and imaging. The SM-2 Seeing Monitor is based on the SBIG ST-i camera combined with a high-quality, 100-mm focal length, f/3.5 lens and custom seeing monitor software written by Dr. Alan Holmes. The SM-1 constantly monitors the seeing for any 12-hour period and displays the measurement on a computer monitor, while logging the data to a text file for later analysis. The lens-camera assembly is mounted in a weather-resistant aluminum box with an optical-quality window for protection from the elements. Removing the cover allows focusing of the camera, and pointing is adjustable within the enclosure. The housing provides room for an optional powered USB 2.0 extender, either underneath or behind the camera. The seeing monitor is particularly useful for those with a permanent installation, but also for those who must set up each night before imaging. By reporting and charting the seeing from night to night and from hour to hour, the user can determine the optimum time to attempt high-resolution images, as well as those times when equipment better suited to wide-field, lower-resolution imaging is the better alternative. The SM-2 also serves as a valuable diagnostic tool, providing a known value against which to measure the performance of your imaging system. If the SM-2 reports seeing of X and your imaging system is only yielding images equating to a seeing value of Y, you will know that your system is not seeing-limited. Seeing data produced by the SM-2 are displayed in units of the zenith Full Width Half Maximum (FWHM) in arc seconds expected for a long-exposure star image. 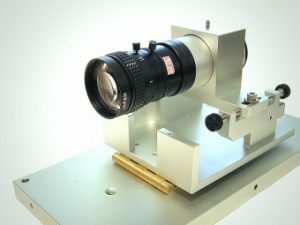 Most professional observatories use the Differential Image Motion Monitor (DIMM) technique to measure seeing. This technique is implemented in hardware by using a two-hole mask over an 8- to 11-inch Schmidt-Cassegrain telescope aperture and measuring the root mean square (rms) fluctuation of the spacing of the two spots seen when a bright star is imaged a little bit out of focus with a fast camera. The reason two spots are measured is that the aggregate motion of the two spots due to poor tracking or wind vibration can therefore be rejected. The resulting system is complicated to automate and requires an automated enclosure to house the telescope, as well, running the total cost up to many thousands of dollars. One problem with the DIMM approach is that it ignores tube currents in the SCT. These are not small, nor correlated across the aperture. In contrast, the SBS SM-2 uses a fixed, single-aperture system staring at Polaris, mounted on a heavy, solid pier to eliminate wind motion and resulting tracking error. Because Polaris moves within the space of a measurement, the linear drift of the centroid of Polaris’s position is determined and corrected. SBS calls this the SIMM technique. An accurate seeing measurement requires exposures of 0.01 seconds, or faster, to freeze the seeing and thus avoid errors resulting from star motion being averaged over a long exposure. In the case of the ST-2, the software collects 256 frames of data, each with an exposure of 0.01 second. The rms image motion is then determined. 256 frames require about a minute of time to collect and process. A high-quality lens with a focal length of 100 mm will achieve sub-pixel accuracy with the centroid calculation, and the motion of Polaris over the course of a night can be contained within the ST-2’s camera sensor at that focal length. Polaris may move in a 180-degree arc during a single night, so its motion must be considered for any long-term monitoring plan. The SBS SM-2 Seeing Monitor is retail priced at $1495US.